Enjoy your well-deserved family vacation in our lovingly and luxuriously appointed holiday home Annette in Glowe auf Rügen. In House Annette you can with your family in every season to forget the stress of everyday life. The stylish 80 m² large, bright house can accommodate up to four adults and two children (up to 8 years). The spacious living area has a comfortable seating area. The cozy sofa serves as oasis to relax and allow two other people a good nights sleep. In House Annette real wood furniture create a beautiful eye-catching. The dining area invites up to six people to dinner and social gathering. For fun and entertainment in the House there is a large LCD TV, DVD player, stereo system and free wireless access. Upstairs are two bedrooms. The bedroom 1 has a double bed with two comfortable spring mattresses, a dresser, a wardrobe, two bedside cabinets and LCD televisions. Bedroom 2 has two single beds, a bedside table, a wardrobe and a dresser. Guests receive a free initial consisting of hand soap, dishwasher tabs, sponge, dishcloth, tea towel, kitchen roll, bath mat and toilet paper. Enjoy on the terrace to the many hours of sunshine reprimanding or relax in the House Annette. Treat yourself to a break in the hot tub or in the infrared sauna and let the evening end comfortably in front of the fireplace. 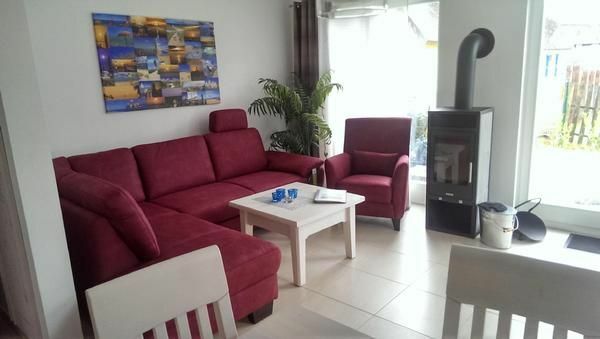 Your holiday house Annette is located in the state-approved leisure Glowe on Ruegen. The accommodation is located within walking distance from the sea. The Baltic invites especially in the summer to hilarious Baden or to various activities. The shallow shore areas at the Schaab suitable for a beach holiday with children. The beach of Glowe is the most beautiful and longest beach of Ruegen. Glowe is particularly popular with nature lovers. Due to the nature diversity prevails in Glowe a pleasant and very healthy climate. The large Jasmund is a mere 600 m. In the immediate vicinity of the cottage the natural reserve of Wittower Heide starts. Enjoy long walks on the long sandy beach of Glowe or in the woods on the Great Jasmund. In Glowe you will find just the right mix of sun, sea, tranquility and attractive leisure opportunities on the Baltic Sea. - Gas: according to consumption (mandatory). - Final cleaning: once per object costs in the amount of 80 EUR (compulsory). - Bed linen: to rent once per person for 10 EUR (optional). - Towels: to rent once per person for 5 EUR (optional). - Pet: one time per pet Costs of 20 EUR (compulsory). - Sauna: per object and day according to consumption (obligatory). - Cot: per object and day included in the price (compulsory). Linen (once per person, available 10 EUR). Towels (one per person, available 5 EUR). Cot (per property per day, included 0 EUR). Sauna (per object and day, included in the price 0 EUR).